Black Metal Square Pillar Candle Holders - Set Of 2 - 4" Tall x 6"
Bolsius Taupe Pillar Candles 2.7X5" Burns Aprox. 40 Hr. Party, Wedding, Events. 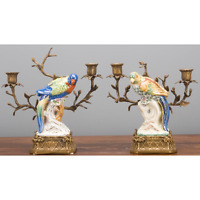 Set of Two Oriental Bronze Ormolu Parrot Birds Porcelain Candle Holders,10''H.